Well, I believe this is my best and my most favourite pasta salad recipe. Ever. Yes I have been watching (too much?) Charlie and Lola lately. I have been making this recipe for over 10 years now. I can not say which book I first saw the recipe in, this is my version, and how we like to eat it. This salad we eat for dinner in summer (and winter, actually) and it is a great one to take along to a BBQ or a picnic. It is very quick to prepare, got to love that. I hope you will enjoy it as much as we do. A handful of green or black pitted olives (or a mixture of both, use as many or few as you like), chopped if you like. Cut the tomatoes in half and chop the feta into cubes. Make two foil parcels to cook the tomatoes and feta in. Using two lengths of foil (each about 50 or 60cm long), fold in half, and add the tomatoes to the centre of one, and the feta to the other. Season to taste (salt and pepper on the tomatoes and pepper on the feta) Fold the sides up around the food, and cover the top too, so each is well enclosed. Meanwhile, cook your pasta and drain. When the tomatoes and feta are cooked, open each parcel carefully, they will be hot and a lot of steam will escape. I allow the feta to cool for 10-20 minutes, this allows it to keep its shape better in the salad. If you don't mind it getting all smashed up, use straight away. 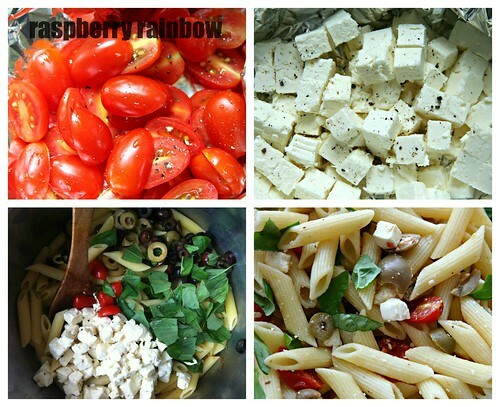 Add the tomatoes, feta and olives to the pasta, mix well. Roughly rip the basil leaves up and mix through with everything else. Even if I have children who will not never ever eat a tomatoa (but they will try moon squirters) I am trying this soon!! This looks so tasty! Plus fresh and fast and filling! What more could you ask for? Thanks for sharing your recipe. Stop it. I can smell it from here and I'm hungry! !